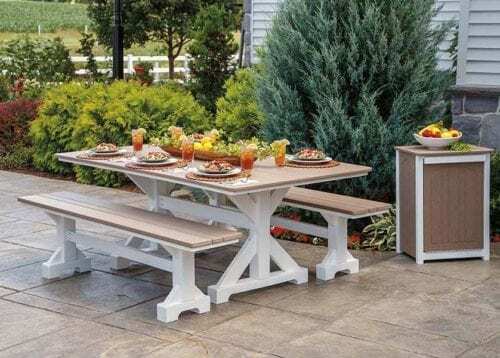 From a relaxing starlight dinner for 2, to a fun outdoor get-together with friends and family; we have a variety of outdoor tables to accommodate both.At Herron’s we have searched out only the best Amish builders of outdoor furniture to guarantee that you will enjoy your time outdoors to the fullest, without having to worry about the normal outdoor maintenance! No more painting or staining- the color and UV protectant is mixed all through the material as it is being made. Leave it outside all winter long and it will still look great year after year! Built solid so it won’t blow away on windy days. Also, coated stainless steel bolts and hardware help resist corrosion and provide sturdy construction for years of hassle-free enjoyment! Many colors to choose from to compliment your lifestyle! From a relaxing starlight dinner for 2, to a fun outdoor get-together with friends and family; we have a variety of outdoor tables to accommodate both. Available in your preference of dining, counter, or bar height! At Herron’s we have searched out only the best Amish builders of outdoor furniture to guarantee that you will enjoy your time outdoors to the fullest, without having to worry about the normal outdoor maintenance! No more painting or staining- the color and UV protectant is mixed all through the material as it is being made. Leave it outside all winter long and it will still look great year after year! Built solid so it won’t blow away on windy days. Also, coated stainless steel bolts and hardware help resist corrosion and provide sturdy construction for years of hassle-free enjoyment! Many colors to choose from to compliment your lifestyle! Relax in comfort & style with the highest quality poly benches, chairs, and stools for your yard, patio, beach, or poolside! 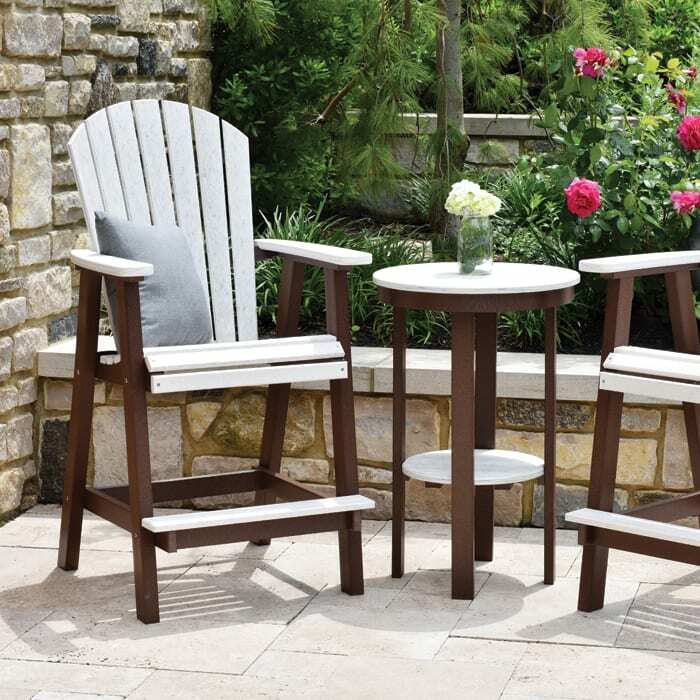 At Herron’s we have searched out only the best Amish builders of outdoor furniture to guarantee that you will enjoy your time outdoors to the fullest, without having to worry about the normal outdoor maintenance! No more painting or staining- the color and UV protectant is mixed all through the material as it is being made. Leave it outside all winter long and it will still look great year after year! Built solid so it won’t blow away on windy days. Also, coated stainless steel bolts and hardware help resist corrosion and provide sturdy construction for years of hassle-free enjoyment! Many colors to choose from to compliment your lifestyle!